On this issue (Volume 3 - Issue 8): U.S. Dept. of Education Assistant Secretary visits TSD • TSD Student to Barca Soccer Academy • Reading Matters at TSD • TSD Sign Choir Celebrates Texas Independence Day • Deaf Talent Shines at TSD! On this issue (Volume 3 - Issue 7): Rangers shine at the Texas Capitol Schoolhouse • Keeping Deaf History Alive • TSD Counselors. Texas School for the Deaf (TSD) students, among those from districts across the state, are demonstrating the latest technology applications used in Texas school classrooms today. On this issue (Volume 3 - Issue 6): ACCESS student worker honored • TSD students celebrate • TSD Governing Board • Special Delivery from Culinary Art Students • April Giauque shines on • Submit a story by January 31st for a chance to win a gift card! ERCOD at TSD is launching newly specialized Summer Camps & Programs. "Bet you can't wait for the summer already! Neither can we and for a good reason too! 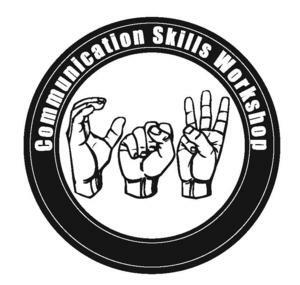 The Educational Resource Center on Deafness (ERCOD at Texas School for the Deaf (TSD) is proud to launch our newly specialized Summer Camps & Programs for preschoolers to young adults who are deaf and hard of hearing in Texas, with a focus on each participant's particular interests. Visit SCP website to register!" On this issue (Volume 3 - Issue 4): TSD Salutes the Veterans • TSD Tours for new students • Middle School Rocks • TSD Alumni named VB Conference Rookie of the Year • Elementary Students Give Back • Get to know Rose Kimball. On this issue (Volume 3 - Issue 2): Brian Cheslik Nominated for Theatre Award Outstanding Actor in Theatre for Young Audiences • Ranger to Ranger Moments • Students Learning Fractions! • TSD kids learning about Hispanic Heritage • ACCESS: Day of Community Service - Submit a story by November 2, for a chance to win a Burro Cheese Kitchen gift card. TSD, like AISD will conduct business as usual tomorrow. We have made this decision based on information from the Austin-Travis County Emergency Operations Center. We encourage everyone to talk to their students about the city’s water situation and about the importance of following the boil water requirements as we work to stay healthy and hydrated. The city of Austin is posting updates online or you can follow them on Twitter @AustinTexasGov or @AustinHSEM. TSD also will continue to post information on our website about how the boil water notice affects our school operations., and we will also share on social media. On this issue (Volume 3 - Issue 1): Rangers Shine in International Competition • TXDPS Troopers meet students • Carilynne Gay returns! • Community Spotlight: Lisa Crawford - Submit a story by September 28th for a chance to win a Thunder Cloud gift card. Organizations worldwide celebrate Deaf Awareness Week in September, a celebration of the achievements of the Deaf community and the rich world of Deaf culture. 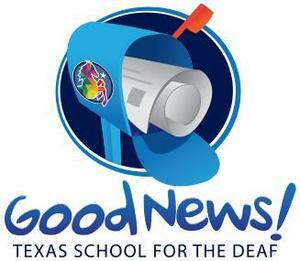 As communities across Texas host Deaf Awareness Week celebrations, Governor Greg Abbott issues a proclamation encouraging all Texans to support and celebrate the many unique achievements of Texans who are deaf or hard of hearing. TSD Foundation announces new Executive Director, Holly Hawk. An added measure of campus safety is in place at Texas School for the Deaf (TSD) thanks to a new partnership with Texas Department of Public Safety (DPS) Capitol Region. Texas School for the Deaf (TSD) Superintendent and Chief Executive Officer, Claire Bugen, received a Lifetime Achievement Award from the Texas Association of Parents and Educators of the Deaf (T.A.P.E.D.) at the recent Texas 2018 Statewide Conference of Education of the Deaf held in Grapevine. Letter from the Superintendent: Welcome Back! We continue on our journey this school year building on our monumental commitment to make TSD the best place possible to Learn, to Grow and to Belong. The 2018-19 school year finds our Ranger to Ranger lens focused on KIDS—and why KIDS MATTER! Due to a power outage impacting AC systems on campus, the CSW schedule is being delayed by one day. Registration is now Monday July 30th beginning at 12:30pm. The workshop will still run through Thursday Aug 2 at noon, and the schedule will be adjusted to accommodate all sessions. Please email csw@tsd.state.tx.us with any questions. CSW provides professional training for Interpreters Certified & Non Certified Interpreters working in a K-12 setting in Texas, Interpreter-Aides, ASL Teachers, Deaf Education Teachers, and Parents of deaf or hard of hearing children in Texas. We are celebrating our 30th Anniversary this year of providing excellence in instruction to our Teachers, Interpreters, and Parents of Deaf and Hard of Hearing children in Texas. TSD Foundation is looking for a new Executive Director! 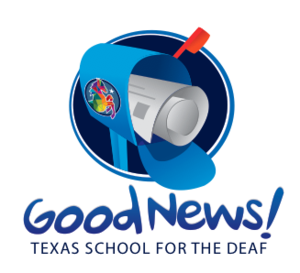 Texas School for the Deaf Foundation (TSDF), a 501 (c)(3) organization, seeks a Consultant to provide supportive and effective Executive Director (ED) leadership to the Foundation. TSDF’s Mission is to strengthen and sustain language, academic achievement and career pathways for deaf students at TSD and across Texas. 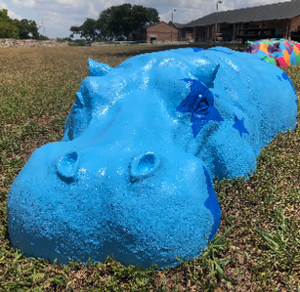 Hippos painted by Texas’ young artists, including students from the Texas School for the Deaf (TSD), are up for auction until June 24, 2018. Proceeds will benefit the school and its art programs.